We live in a mobile-first world, and many of our customers find themselves needing their subscription metrics outside of the office. ChartMogul customer Cynapse has come up with a solution for customers who want anywhere access to their most important metrics. We love to see developers build on top of our Metrics API, especially when it makes it easier for ChartMogul customers to access their data. So we’re incredibly excited to share that the team at Cynapse has brought ChartMogul data to its app, Numerics. Numerics is a real-time dashboarding app that spans all of your Apple devices, including Apple Watch and Apple TV. You can create personalized dashboards by choosing from hundreds of pre-designed KPI templates, and it integrates with major software like Google Analytics, Salesforce and Zendesk. Their new ChartMogul integration offers three widget packs: The Basic pack — which includes ARR, customer count and MRR — is free. The Advanced Stats and Plan Stats packs — which reveal the rest of your ChartMogul KPIs and lets you segment by plan — are available with Numerics Pro, which is $9.99 per month. 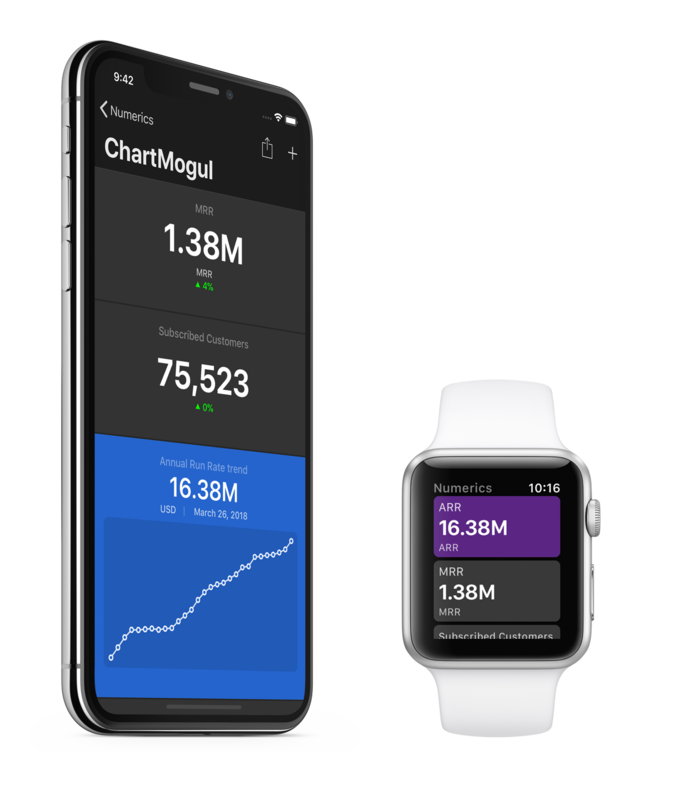 With Numerics, ChartMogul customers can monitor their KPIs from iOS devices and track week-over-week or month-over-month changes. ChartMogul calculations can be viewed as either top-level numbers or trendlines. Numerics helps ChartMogul customers stay up-to-date on KPIs, no matter where they are. Download Numerics and access your most important data from anywhere. Numerics is available in the App Store as a free download. We think this is an excellent use of our Metrics API, which is open to all ChartMogul customers. Have an idea for an integration? Check out the documentation and start building!